In past years The FitExpo has been a huge event with great new products to test out and new devices to try, and plenty of your favorite fitness models and celebs. This year should be one of the best years yet since it’s featuring some big names and some innovative products. Don’t forget that there are TONS on samples to try! I usually walk away with a HUGE bag of goodies! Here’s a Sneak Peak At Whats To Come From The FitExpo This Weekend ! Sporteer – High performance arm band that works with smart phones for gym goers and athletes to track performance. Jillian Michaels Will Be Doing Body Shred ! TheFitExpo offers something for everyBODY! Attendees will find over 100 fitness and sports celebrities as well as 20 amateur, professional, Olympic and attendee competitions and 400 exhibits offering the latest in fitness, diet, nutrition, strength and wellness products and services. During both days of the Expo, many leading fitness professionals will be presenting educational seminars and demonstrations on subjects such as proper nutrition and dieting and exercise philosophies.Adult admission tickets are $20 per day or $30 for the full weekend. Children 12 years and under are $10 per day and children under 6 are free. Show hours are Saturday, 10:00 a.m. – 6:30 p.m. and Sunday, 10:00 a.m. – 5:00 p.m. Plenty of parking is available. For full information on TheFitExpo ticketing, exhibiting or sponsorship opportunities call (818) 545-0290 or visit www.thefitexpo.com. This event is also sponsored by Body fortress and Subway. 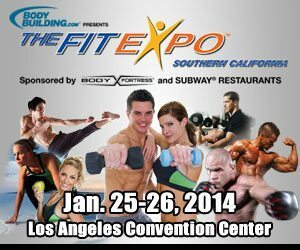 If you have time this weekend and you are in the Los Angeles area, The FitExpo is definitely worth coming to! It’s a great way to jump start your year and get motivate by others who are already on the right path! If you’re out of state and you can’t make it, then stay tuned! Next week I’ll be posting some video and Images from the event!